Amid preparations for a cocoa bean auction at Amsterdam’s historic stock exchange, Brigitte Laliberté spoke with Bioversity International about the newly released ruby chocolate, the Cocoa of Excellence Programme’s plans for the year and the best chocolates to gift on Valentine’s Day. The program, coordinated by Bioversity International, is jointly organized with Event International in partnership with the CGIAR Research Program on Forests, Trees and Agroforestry (FTA) and a number of other organizations. It generates incentives for producers to cultivate diverse cocoa varieties, leading to high-quality chocolate as the end result. Something innovative happened last year – a new chocolate was launched on the global market. What makes ruby chocolate special? Ruby chocolate is a new type of chocolate compared to the three classics: white, milk and dark. All of these are results of different ways of processing the cocoa bean: the type of fermentation that the beans undergo after they are harvested and dried. Basically, white chocolate is made of cocoa butter, milk and sugar, milk chocolate cocoa butter and cocoa mass with sugar and milk whereas dark chocolate has no milk, therefore only cocoa (butter and mass) and sugar. All of these may have other ingredients such as fruits, nuts, vanilla and other spices. But in essence these are the basic differentiations. Ruby has come out as the fourth type. While its ‘recipe’ is under wraps, I’m guessing that they’ve used a combination of fermentation techniques and specific cacao varieties to come up with the trendy pink color. Most cocoa beans are purple in color before they are fermented. In a way, it is similar to wine: you might have your favorite wine but it is always interesting to taste something that you have not tasted before. The terroir – how a particular region’s climate, soils and aspect affect the taste of the crop – also makes a difference in cocoa. The same variety planted in Ghana and Australia will taste differently because of the differences in the farms’ soil, agronomic practices and most importantly the fermentation and drying process. Depending on how it is carried out, the amount of days the beans are fermented, the local humidity and temperature can have an impact on the flavor of the bean even if, genetically, it is the same variety planted in another country or even region. What is the best type of chocolate to give a special someone on Valentine’s Day? It does not matter much if it is while, brown or pink, or filled. It depends on what that special someone likes! Do they enjoy a particular type of chocolate? Then that is the one to offer. As coordinator of the Cocoa of Excellence Programme, what is keeping you and your team busy? My team and I are currently preparing the next edition of the Cocoa of Excellence Programme, which will be announced this summer. Before we open the call for all cocoa producing countries around the world, we’ll be reviewing the guidelines and promoting the winners of the International Cocoa Awards that were celebrated in Paris last year. 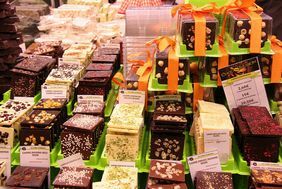 What is happening that is very special is the Chocoa Trade Fair that will take place in Amsterdam next week. As part of this, we’ll host a chocolate auction at the historical Amsterdam stock exchange: the same place where cocoa was traded centuries ago. We’ll recreate a live cocoa bean auction featuring three winning International Cocoa Awards bean samples, representing Tanzania, Madagascar and Colombia, and have an auctioneer. 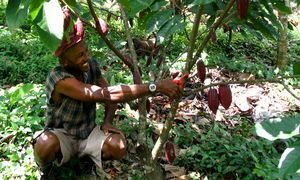 We hope that the bidders – chocolate producers and other cocoa bean buyers – will offer more than the current price of the cocoa beans; any profit made will go directly to the bean producers for a project of their choice. The Cocoa of Excellence Programme, coordinated by Bioversity International, is jointly organized with Event International in partnership with the CGIAR Research Program on Forests, Trees and Agroforestry (FTA), Guittard Chocolate, Seguine Cacao, Cocoa and Chocolate, Barry Callebaut, Puratos and the International Cocoa Organization (ICCO) with sponsorship from the European Cocoa Association (ECA), the Association of Chocolate, Biscuit and Confectionery Industries of Europe (Caobisco), the Federation of Cocoa Commerce (FCC), Nestlé, the Lutheran World Relief (LWR), Mars UK, Valrhona and with in-kind contributions from the Cocoa Research Centre of the University of the West Indies (CRC/UWI), Valrhona, Weiss Chocolate and CocoaTown. This work is supported by CGIAR Fund Donors.